One of the most highly anticipated exhibitions of 2016 opens in London, March 5: Botticelli Reimagined. Gazing upon The Birth of Venus, in person, in the grandeur of the Uffizi Gallery in Florence is nothing short of spectacular. 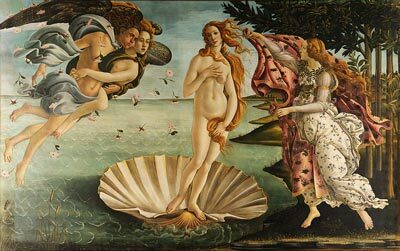 As one of the great Renaissance painters, Sandro Botticelli and his masterpiece The Birth of Venus (pictured above) has wowed art lovers and inspired artists for centuries. Botticelli Reimagined, at London’s V&A Museum, brings together over fifty of Botticelli’s artistic works rarely seen in the UK. Complementing the exhibition, are works from artists and designers inspired by Botticelli – from Jeff Koons and Andy Warhol, to Magritte and Dolce & Gabbana. This is an innovative collection of work which explores the enduring legacy and influence of Botticelli’s works. The exhibition will give you a taste of the 15th century Florentine master but two of his most famous masterpieces remain in Italy. 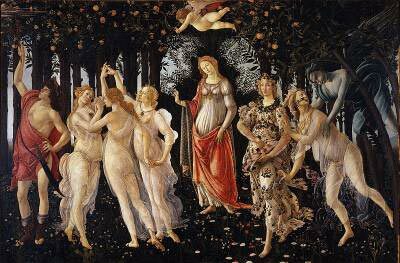 Botticelli’s Nascita di Venere (The Birth of Venus 1482-85), and La Primavera (Allegory of Spring 1477-82), are both on permanent display in Florence’s Uffizi Gallery. Florence is one of Europe’s most artistically rich cities. It is the home to so many iconic artists and enduring works of art. Giotto, Michelangelo, Botticelli, Leonardo da Vinci, Donatello just to name but a few. But, with so much art and architecture to take in, it’s tricky to know where to start. Luckily, most of the major historical sights and galleries are within walking distance of the centre. Top of our list is the Uffizi Gallery. The Uffizi is one of the oldest and most visited museums in Italy. The queues outside are staggering, so our tip is to book ahead. This way you can feel terribly clever as you skip to the front of the enormous queue, not to mention that you’ll have more time to spend in the gallery. The gallery is a labyrinth of frescoed ceilings, hallways and rooms displaying Renaissance art and sculpture. High on your agenda should be the room dedicated to Florentine master Sandro Botticelli. Here you can witness the artist’s finest and most famous works such as Nascita di Venere (The Birth of Venus), and La Primavera (Allegory of Spring). With rooms of ancient Roman sculptures, and endless works by Renaissance masters such Leonardo da Vinci and Raphael, you could fill several days taking it all in. From the Uffizi you can enjoy stunning views of the River Arno, the Ponte Vecchio (arched bridge over River Arno) and the hills beyond Florence. Touring the Uffizi is one of the highlights of visiting Florence, and is a must for any art lover. The Basilica di Santa Maria del Fiore dominates Florence’s skyline and the historical centre of the city. The cathedral is the third largest in the world, and although entry is free, it is definitely worth paying the additional €8 or so to climb up into Brunelleschi’s Dome or the cathedral’s campanile (bell tower). Incredibly, the architect Filippo Brunelleschi constructed the enormous dome without using any scaffolding. His ‘double shell’ concept of building a two-layered dome, was one of the most innovative engineering concepts of the age. Today, the view from the top is perhaps the best way to see Florence, and the 500 steps to the top are a great way to work off a hearty Italian lunch. To view the original ‘David’ sculpture you must visit the Galleria dell’Accademia in Florence. Created between 1501-1504, the 14 foot statue was originally destined to be on display in the Cathedral of Florence. When the sculpture was revealed to the Vestry Board, awed by its beauty, they decided the sculpture was ‘too perfect’ to be placed up high in the cathedral. A committee of local artists including, Leonardo da Vinci and Botticelli, were called upon to decide on a new place for the statue in the city. Eventually, the statue was placed in the Piazza della Signoria. David remained in the square until 1873, when it was decided it should move to the Accademia to protect the statue from weathering. Set in one of the oldest buildings in Florence, the National Museum of Bargello houses an amazing collection of sculptures including, Donatello’s ‘David’, Michelangelo’s ‘Brutus’ and many, many more. Step into the museum’s stunning courtyard (pictured above) and wander through its cloisters and open corridors. Alongside the work of the great sculptors, keep an eye out for the work of their students. The Bargello collection also includes 2 panels, entered by Lorenzo Ghiberti and Filippo Brunelleschi, for the Baptistery door competition of 1401. For Renaissance art lovers, the Bargello is to sculpture what the Uffizi is to painting. A day trip to Florence is included on our short breaks to Tuscany. Our spring and autumn dates are an ideal time to visit the museums, as these seasons are less crowded than summer when you’ll be elbowing your way around the galleries.